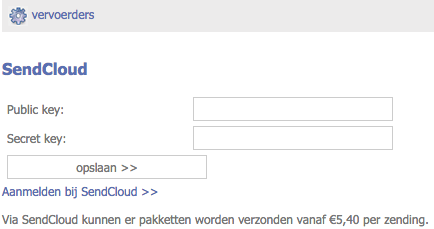 Log in to your GratisWebshopBeginnen account and go to your management settings in the left menu. Choose > Gratiswebshop and 'Carriers'. You will see the following screen. Here you can copy/paste the API keys from your SendCloud account. This will be explained in the next step. When logging in to SendCloud you choose 'Settings' > 'Connected shops'. Here you have the option to 'add a new shop' in the right top corner. Choose between the available shops for SendCloud API. And Save the settings. Now you can copy/paste the public & secret key in your GratisWebshopBeginnen and your connection is good to go!